If you’re trying to foster a culture of productive conflict in your team, be careful that your language doesn’t let them off the hook. Getting your team members to stick a toe in the water of dissention, challenge, and disagreement is a big ask. If your language makes it seem optional, it’s not likely that people will give it a try. Today, I want to give you the framework for a conversation you can have with your team that will help shift their mindset from productive conflict being optional to it being non-negotiable. Flash forward to the next fall when I find the permission form for cross-country in her backpack. I sign it and holler enthusiastically, “Your form is in your bag!” The next weekend, I’m doing my weekly hazardous waste check of the backpack, and what do I find at the bottom of the bag—a soggy, crumpled permission form. And that’s my a-ha moment. Giving someone permission to do something they don’t want to do doesn’t work. Giving someone permission to do something they don’t want to do doesn’t work. Unfortunately, that’s what we do when it comes to productive conflict. We give people permission to give us feedback, to challenge our ideas, to instigate a debate, but they tuck that permission away because they aren’t interested in doing those things. As far as they’re concerned, conflict is optional, and they choose not to exercise that option. We need an alternative to giving permission. If you want to create a culture of productive conflict on your team, you need to set up an obligation. Each person needs to understand the consequence to the team if they don’t step up and challenge. 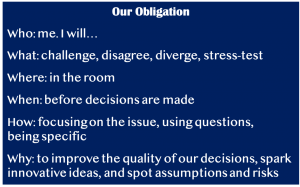 I encourage you to have a discussion with your team about the obligation to disagree. Feel free to use my cross-country story! Here are some conversation guides you can use. What do we need to disagree about? How could our team benefit if we disagreed more with one another? What are some examples of constructive tensions we could add to our discussions? What happens if you think something contrary but don’t say it? How is the business affected if we stifle conflicting opinions? What does it mean to be the devil’s advocate? How can that role be helpful? How does it go awry? How do we need to disagree? When is the right time to disagree with a decision? When is the wrong time? How can we raise different perspectives so that it feels constructive? What behavior would derail our attempts at productive conflict? 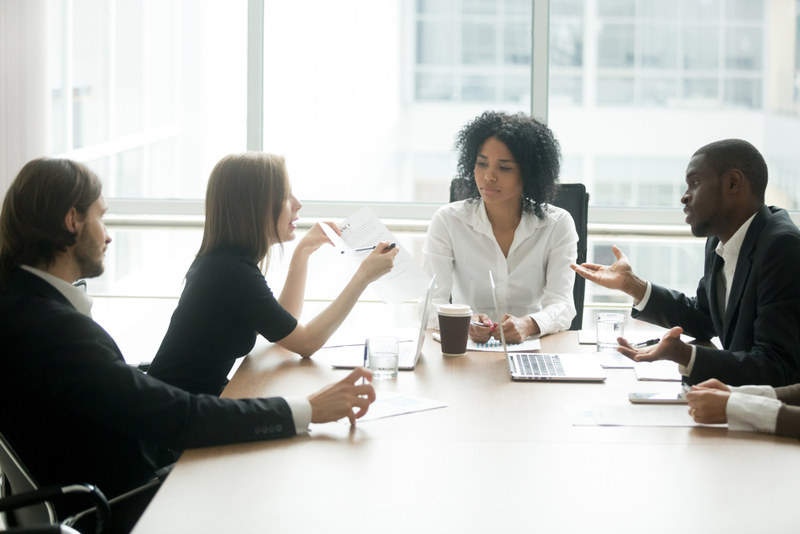 At the end of this discussion, I encourage you to summarize your commitments into a short set of guidelines your team will follow when it comes to productive conflict. You can use this format or create your own. Heather, it’s so great when my timing is good. Please let me know how it goes and shoot me a note if you have any questions! Good luck!